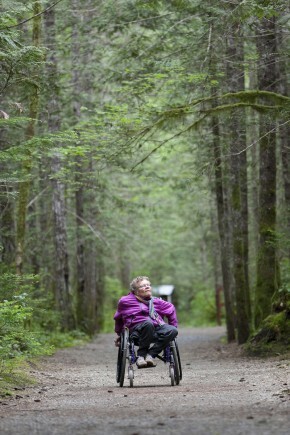 Accessible Wilderness Society seeks to provide access to nature for all. the choreography—not to mention the energy—demanded on a daily basis from a woman in her 30s who is married with two pre-school age children (Zoe, clinic six, and Linus, just under two), who works full-time in the North Island College marketing department, and who also manages to set aside two hours each and every day to write. Oh, and who is, incidentally, a published author, not just a dabbler. Though Bannerman spent her childhood years in Royston, she is fully a Cumberland girl at heart and when she moved back to the Comox Valley after a number of years living in Vancouver, it seemed like a natural move. It also seemed natural that her latest published book—her fourth (the others are The Tattooed Wolf from 2003, The Wolf of Gilsbury Cross 2006, and the Fire Song 2011)—Bucket of Blood should be set in Cumberland. It’s a work of fiction, she says, but it bears testimony to fact and to her heritage. “When I was researching for the book I drove around Cumberland with my dad so he could point out some sites and their stories that I might be able to use. That’s why the book is dedicated to him, and I’m only sorry he didn’t get to see it,” she says. Her father, Ron Bannerman was a well-respected Comox Valley educator and, on his retirement he and his wife Cindy ran heritage tours throughout the Valley. They were also instrumental in the development of Cumberland’s No. 6 Mine Heritage Park. He died unexpectedly in November, 2009. But, having been born and raised in Cumberland, he knew the community like the back of his hand, and Bannerman cherishes his legacy. Bannerman’s background led, in a roundabout way, to where she is now. After graduating from GP Vanier, she headed out to the metaphorical ‘big city’ to study anthropology at the University of BC. Initially interested in forensic anthropology—crime scenes, corpses, causes of death and other CSI stuff—she branched off more into historical anthropology. More specifically, she became intrigued by Celtic history and this led her to study for a time in England in 1998. “I became intrigued by the character Boudicca and her role in that whole Roman period in England,” she says. Boudicca was the leader of the Iceni peoples of East Anglia and mounted a campaign against the Roman legions in AD 60 in which she and her army burned the Roman capital of Colchester and went on later to capture London. She is a huge folk hero in that part of England. As life evolved, Bannerman and husband Shawn spent more than 10 years living in Vancouver, during which time she had an eclectic array of jobs, including working for the Vancouver Public Library, the Museum of Anthropology at UBC, and Opus Framing and Art Supplies. And then the two of them decided it was time to decamp for the Comox Valley. Her first big literary break came in 2003 when her lupine saga The Tattooed Wolf was e-published. When she was seeking publication at that time she was cognizant of Canada’s uninviting publishing reputation. It’s simply a huge challenge for a first-time, agent-less writer to get published here. So, she decided to go with the science-fiction e-publisher Double Dragon. It worked, and Bannerman has no regrets about taking that route away from the conventional format of paper between covers. Now, in the age of Kindle and Kobo it has become even more acceptable. After all, 2003 was nearly a decade ago, and that’s about a millennium in terms of the rate of tech-advances these days. The werewolf saga, The Tattooed Wolf, grew out of a childhood conversation with an uncle who attempted to scare the bejesus out of his young niece (as uncles will sometimes do) by filling her head with tales of supernatural lupines. The message stuck with Bannerman, and ultimately it was translated into her first book. What is Bannerman’s process? Well, unlike some famous literary procrastinators such as Dorothy Parker who once said, in effect, she didn’t like to write, she liked “having written”, Bannerman actually likes to write. Even more of an oversight, she says, considering her huge family connectedness to the old village, going back to her grandfather and father, both of whom were born there. Her ‘process’ demands a considerable discipline that she tries to adhere to as stringently as possible. This includes devoting two hours each and every day to writing. And this is not a chore. She does a few things when she’s blocked. One is to merely step away from it for a while until her writing mojo returns. Otherwise, she’ll do a related task—like editing. Bucket of Blood was launched last September 21 at North Island College, where Bannerman also works. A reading from the novel was offered to the public at the launch. While the book is, as a novel, fictional, Bannerman assures that elements of the tale did not arise in a vacuum, but are based on veracities of the day— the late 19th Century when Cumberland was a booming coal town and indeed the ‘metropolis’ of the Comox Valley, and the smaller communities as Courtenay and Comox were of little consequence. This is the Cumberland of the Dunsmuir mines and of a Chinatown that was more populous than the European community. The Chinese did, as a character in Bucket of Blood slightly bitterly but realistically states: “twice the work for half the pay” and longed to make that nest egg so they could return to China as rich men and find themselves comely wives. Those who know the area also know of the brutal conditions in the mines for the Chinese in Cumberland, where in the early days the laborers weren’t even granted the dignity of using their names but were merely referred to using the names of their European overlords, such as “Smith’s Chinaman”. Old write-ups in the Cumberland Museum attest to the racism of the era. As a consequence, and understandably, the Asians created their own community in Chinatown— an alien and mysterious place. Chinatown in the day was opium dens, fan-tan parlors, prostitution, danger and mystery. It was in that cultural milieu that Bannerman’s characters, English born Lizzie Saunders and her older sister, Violet found themselves on the death of their mother in 1898. Though the midnight hour had come and gone, Cumberland’s main street roiled with life. The steady chuh-chuh of No. 6 mine’s bellows, coupled with the distant clanking of industry, provided a rhythmic beat to the merry-making of the Bank Holiday weekend. Men in filthy dungarees stumbled into the bars for a pint of bitter to slake their thirsts, work-calloused boys drove a new shift of mules along Dunsmuir and women of questionable morals solicited company from drunken louts who loitered outside the flop houses and pool hall. Boisterous piano music, cat calls wolf whistles, and the deafening sounds of nihilistic revelry filled the air. Such is the pervasive mood and ambience of Bucket of Blood and Bannerman captures it with a crisp and inviting style that does not fail to keep a reader intrigued. She is also adept at presenting dialogue as it would have been in the late Victorian era amongst those who both toiled in the bowels of the earth as well as with those of higher social pretensions. But, the point of this piece is not to offer literary evaluation rather than to look at the life and process of an already and deservedly successful Comox Valley writer. Needless to say, therefore, that the reader will find the book moves at a pace, offers a delightful degree of a fictionalized Cumberland (and other spots) that doesn’t deviate far from the reality of the day; it merely enhances it to a deserved three-dimensionality. It’s a good read, suffice it to say. Where is Bannerman now and where does she go from this point? She says, in the latter case, she follows Vancouver Province digital journalist Erik Rolfsen and his drive to bring factual information away from ink and into the greater sphere globally. Meanwhile, she’s mapping out a storyline for a non-fiction work, but declines to say more about it at this time. six, and Linus, just under two), who works full-time in the North Island College marketing department, and who also manages to set aside two hours each and every day to write. paradise would include a place in the wilderness. Unfortunately, for a good number of BC citizens, the wilderness is not accessible. A person with a disability can only see the trail winding into the trees, but they can’t explore it. Fortunately, this is changing. There are groups working hard to create wilderness accessible trails for everybody and every body, no matter their level of ability. “There aren’t many places I can’t get to,” says Judy Norbury, who has been working hard alongside the Accessible Wilderness Society and other volunteers to make sure everyone can enjoy access to our local wilderness areas. The Accessible Wilderness Society is always looking for volunteers. You can visit their site and learn about their exciting future projects by going to www.awsociety.org.